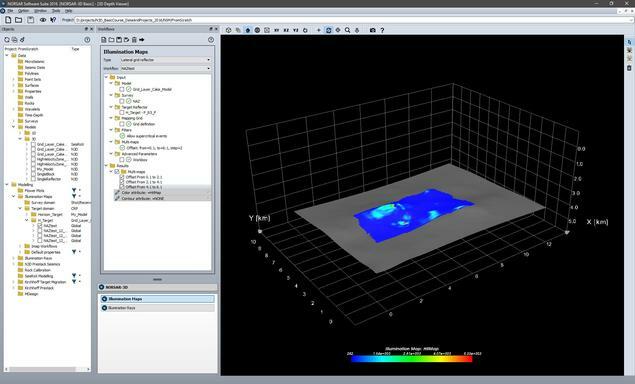 The new NORSAR-3D unveils a revolutionary new user interface for the NORSAR software. It makes the advanced and proven NORSAR-3D technology available in a completely new and simplified user experience. 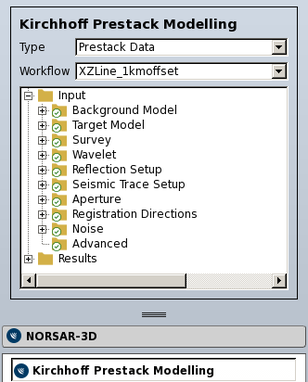 NORSAR-3D is now part of the new NORSAR Software Suite framework. The new NORSAR-3D is available in three different configurations: Basic, Pro and Expert. NORSAR-3D Basic is part of NORSAR-3D Pro and NORSAR-3D Pro is part of NORSAR-3D Expert. The NORSAR-3D Pro version is the upgrade version for existing customers. The new NORSAR-3D versions are backward compatible with older versions of NORSAR-3D project data. All NORSAR-3D configurations are available on both Windows and Linux. 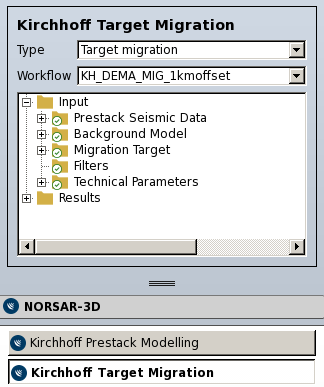 The NORSAR-3D package also includes batch processing, allowing models to be computed on multiple processors, greatly speeding up the turn around time. NORSAR-3D is the most advanced product on the market for seismic illumination studies and model-based survey evaluation and analysis. The package is also used on a full industrial scale for generation of traveltime maps for Prestack Depth Migration (PSDM). NORSAR-3D uses the Open Ray Model representation to simplify model construction. The technology even allows seismic ray tracing in preliminary or incomplete depth models. 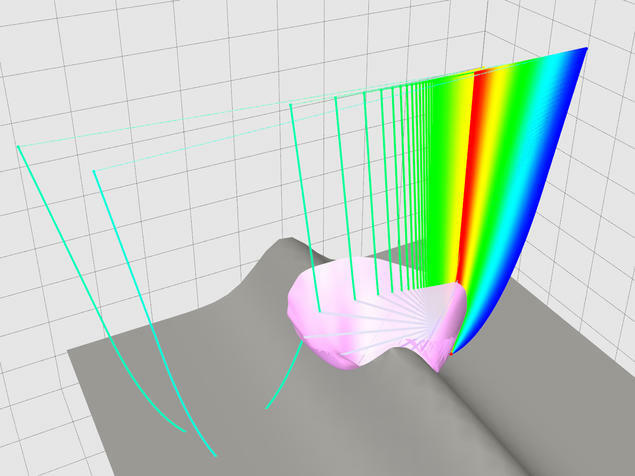 The wavefront construction technique, first developed and implemented at NORSAR, ensures that all calculated rays are consistent in the Open Ray Model. Model run times are reduced, without compromising results, by the efficient way in which NORSAR-3D calculates ray contributions for a large number of shot and receiver positions. 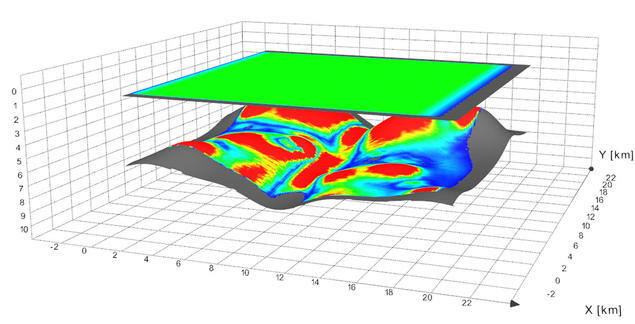 Ray-based seismic modeling methods can be applied at various stages of the exploration and production process. The standard ray method has several advantages, include computational efficiency and the possibility of simulating propagation of elementary waves. As a high-frequency approximation, the method also has some limitations, particularly with respect to a lack of amplitude reliability in the presence of rapid changes of the model functions representing elastic parameters and interfaces. 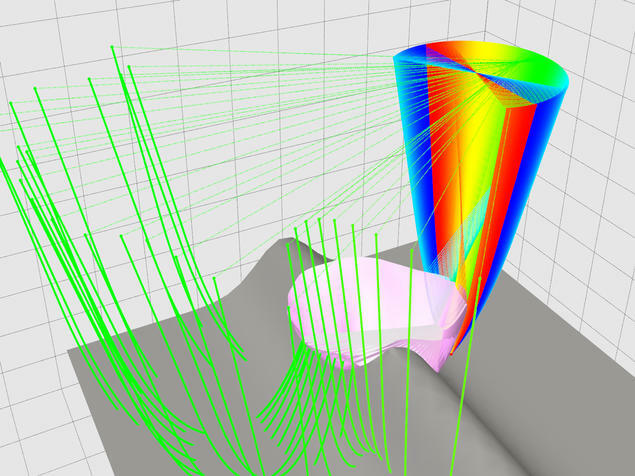 Given the objective of improving the applicability of the standard ray tracing method, we introduce Kirchhoff modelling to our software portfolio. It is based on the well-known Kirchhoff integral solution for calculating the seismic wavefield between a shot and receiver in the given Background Model, for a given target. 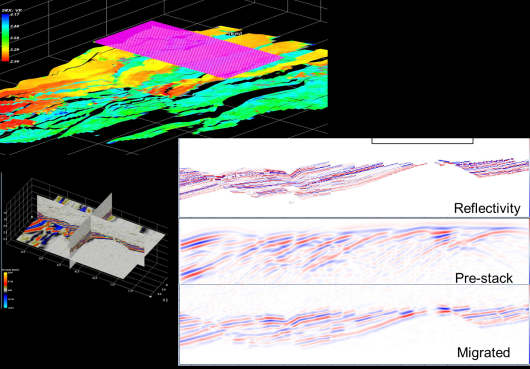 The Kirchhoff integral provides a robust method for implementing seismic modelling and prestack depth migration. Thus, with this approach we are able to convert a velocity model given in depth domain to seismic data in time domain and to migrate the shot data to a depth image. Kirchhoff modelling keeps the flexibility of ray tracing (selection of a part of the wavefield, efficiency) while adding benefits known from FD modelling (diffractions). Kirchhoff modelling is slower than raytracing, but more efficient and flexible than FD modelling. 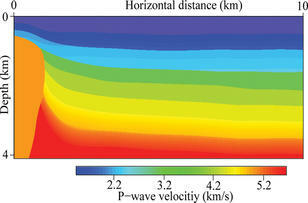 Forward modelling of seismic data is the use of geological models of the earth to simulate seismic field experiments. Models can be one, two, or three dimensional and consist of depth horizons and associated elastic properties, such as P wave velocities, S wave velocities, and densities. An application of forward modelling is for verification of structural and stratigraphic interpretations. 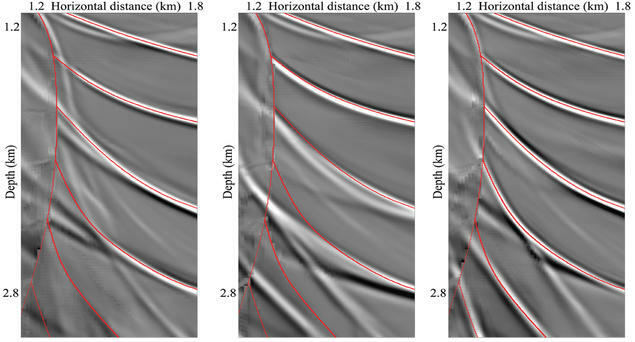 For example, synthetic seismic sections derived from forward modelling can be compared to stacked sections to verify the original interpretation. If needed, the original interpretation or model is altered, and the process repeated until a desired correlation between the actual data and modelled results is observed. In this contribution, we present Kirchhoff prestack data workflow, which is a powerful, robust, and flexible method to generate synthetic traces. This workflow allows to generate synthetic seismograms on either the complete set of horizons or a sub-selected set of horizons. Generate the data you need! The new Kirchhoff modelling software allows to select which part of the wave field should be included, thus it is easier to identify specific events in you real data by correlating with the synthetic seismic traces. Seismic data processing is aimed to image the earth's subsurface, that is, obtaining a picture of subsurface structure from the seismic waves recorded at the earth's surface. Of the many processes applied to seismic data, seismic migration is the one most directly associated with the notion of imaging. Until the migration step, seismic data are merely recorded traces of waves that have been reflected/diffracted from anomalies in the subsurface. 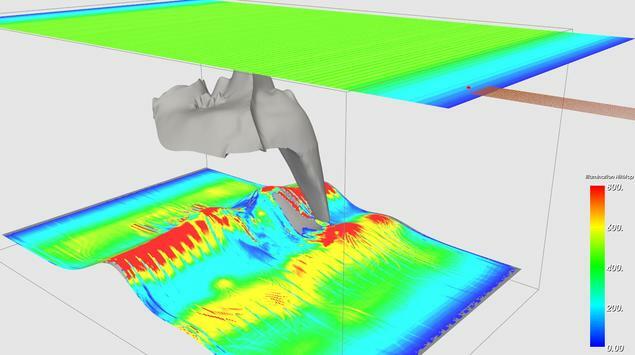 In its simplest form, seismic migration is the process that converts information as a function of recording time to features in subsurface depth. It moves dipping events to their correct positions, collapses diffractions, increases spatial resolution and is probably the most important of all processing stages. In order to provide the complete picture to the user, we have integrated a Kirchhoff target migration workflow into the existing modelling environment. Here, the generated synthetic data will be directly transferred into the corresponding picture of the sub-surface for a given input set up. Find out how sensitive the migrated result is to velocity deviations. Are the targets well illuminated? Are there shadow zones? How large migration aperture is required? How long streamers are required? Illumination maps show how well a target horizon is illuminated by a survey. The basic map is the hit map, which shows for a survey how many rays from shots to receivers reflect on the different parts of the horizon. Shadow zones clearly stand out on hit maps. There are more maps; they show different parameters computed along the rays, including: Travel time, reflection angle, required migration aperture, and amplitude. The maps are divided into grid cells, and for each parameter the maps show how minimum, maximum, and average value of the parameters vary across the horizon. A map can be restricted to a certain interval of another parameter. For example, separate maps can be made for different offset intervals, to show which offsets are important in a survey. Most commonly, the illumination information is put down on the target, but similar maps can also be made with the information posted in the shot or receiver locations. These maps show which shot and receiver positions contribute most to the illumination, and the maps may reveal that shots or receivers may be skipped in some areas. Comparison of the nominal fold, here shown on the surface, and the expected fold at the target, computed as a hit map. 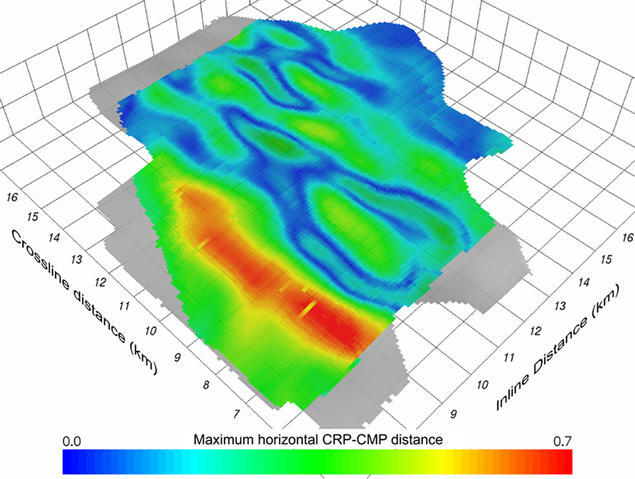 Illumination map showing maximum horizontal difference between common reflection point (CRP) and common midpoint (CMP). This is the required migration aperture if all reflections are to be depth migrated. Which survey azimuths and offsets are required to illuminate a point on the target? Does it change along the target? Which reflection angles and azimuths does a survey cover in a target point? How does the angular coverage change along the target? Where do rays propagate down to the target? To investigate how rays propagate down to a target, use the interactive point-and-click ray-tracing function. All rays down to a selected point on a reflector are shown, for one reflection angle or azimuth at a time. For a more systematic and comprehensive analysis, use the illumination rays workflows. 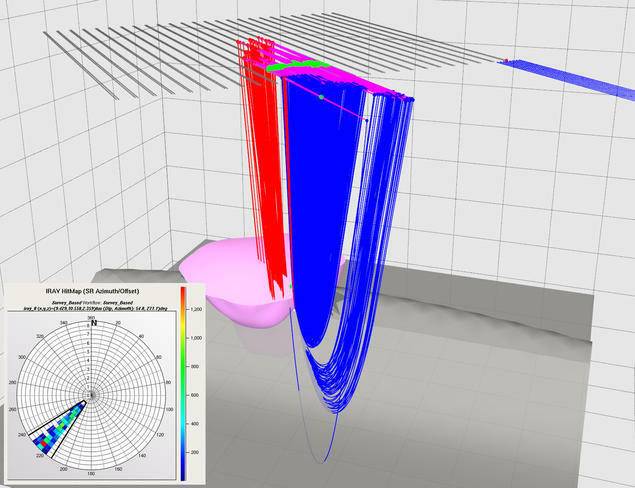 In the work-flows, many target points can be analysed, and all reflection angles and azimuths are taken into account. The results for each target point are shown in a survey- and a target-domain rose diagram. The survey-domain roses show which shot-receiver offsets and azimuths illuminate the target points, while the target-domain roses show which reflection angles and azimuths are covered. The roses are displayed down in the target points to make it easy to see how the illumination varies across the target. The roses are interactive: Click inside a rose to see the corresponding rays. The analysis can be restricted to show the illumination for a particular survey. Alternatively, all rays to the target points can be used, disregarding surveys. This is very useful early in the survey planning, to get an overview of which azimuths and offsets must be involved to illuminate the different parts of the target. Interactive point-and-click ray-tracing for one reflection angle. Interactive point-and-click ray-tracing for one reflection azimuth. The rays to a target point for a marine survey. See this Illumination Ray Concept presentation for more information. Anisotropy within rock units results in a variation in seismic velocity that depends on the direction in which the ray is propagating. Introducing anisotropy into seismic modelling is essential to accurately reproduce the transmission of seismic energy through the earth. The anisotropy option within NORSAR-3D upgrades the software package to enable TTI anisotropy to be included in layered models. This option enables a more realistic earth model to be constructed, resulting in e.g. an improvement in traveltimes for PSDM and tomography applications. We have been very pleased with the imaging using the VTI anisotropy... The data on which we tested the imaging with the anisotropy option showed significant enhancement of structural detail over the migration using the isotropic travel times, which in turn was far superior to the previous prestack time migration. An example of a salt structure with several adjacent transversely isotropic shale layers where the axis of symmetry is normal to the bedding (the two top pictures). Depth migrated images are shown (from left to right) using an isotropic model, a VTI model and the TTI model. 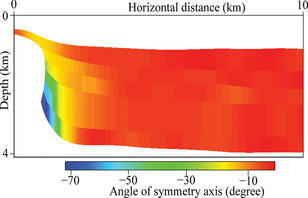 It can be seen that a good subsurface image in the vicinity of the salt dome is obtained only when using the TTI model. The VTI model shows a misfit for the lower reflectors whereas the isotropic model images them poorly.